Pacific herring (Clupea pallasii). Image courtesy of NOAA. Migratory populations of Pacific herring (Clupea pallasii) cycle between the winter spawning grounds in the inside waters and the mouth of the Strait of Juan de Fuca in the summer, while resident stocks reside in the inside waters year-round. The faster individual growth rates observed in some herring populations are thought to be the result of fish leaving Puget Sound to feed in more productive oceanic waters and thus help to differentiate between migratory and resident stocks. For example, the Squaxin Pass herring population has a slower growth rate and is classified as “resident” while the Cherry Point population has a faster growth rate and is classified as “migratory”. 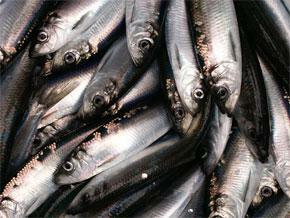 Herring spawning occurs between January and April, with the majority of spawning taking place in February and March. Herring become ready to spawn over a two-month period by moving from deep water into shallow nearshore areas. The large natural and decadal oscillations in herring stock abundance are reflected in the area of spawning used annually. Most spawning areas appear to have “outlier” areas, used only during periods of high stock abundance, and “core” areas, used during periods of low stock abundance. Herring spawn on benthic marine macro-vegetation such as eelgrass or red macroalgae in the shallow subtidal and low intertidal region. Herring spawn preferentially in sheltered bays as opposed to vegetation beds on adjacent open shorelines.